How funny is this photo, i feel like its from a shampoo advert!! Milk Bottle Legs: c/o British Weather! Oh my!! Could my legs BE any whiter? oh sun please come visit soon, looking at those milk bottles up there is depressing! it may be time for some fake tan. Having said that, the legs are well and truly put away, its chilly. And i know lots of you are having a massive heatwave at the mo, and i would like to offer up a weather swap with you! This dress is from Neo’s birthday last year (yes i bought a dress for me for my sons birthday, i wanted to look like a pretty hostess for his party… any excuse for a new frock, am i right?) and i’ve only just started wearing it again. Infact it’s only it’s 3rd ever outing. i don’t know why, its lovely!! teeny tiny scattered hearts and bright colours, what’s not to like. Wishing you a super lovely week all! I keep hoping we'll get some sunshine soon! 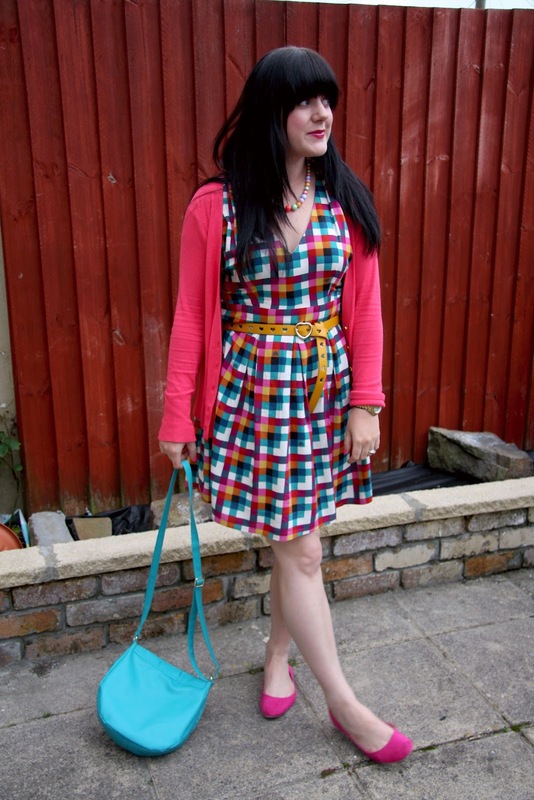 Your dress looks fabulous though – so lovely and summery – despite the weather! Love the colour of your dress brightening up my day. Ahhh that dress is so dreamy! It's reminding me of a game of Tetris, haha! That dress is absolutely amazing. I love how you styled it! 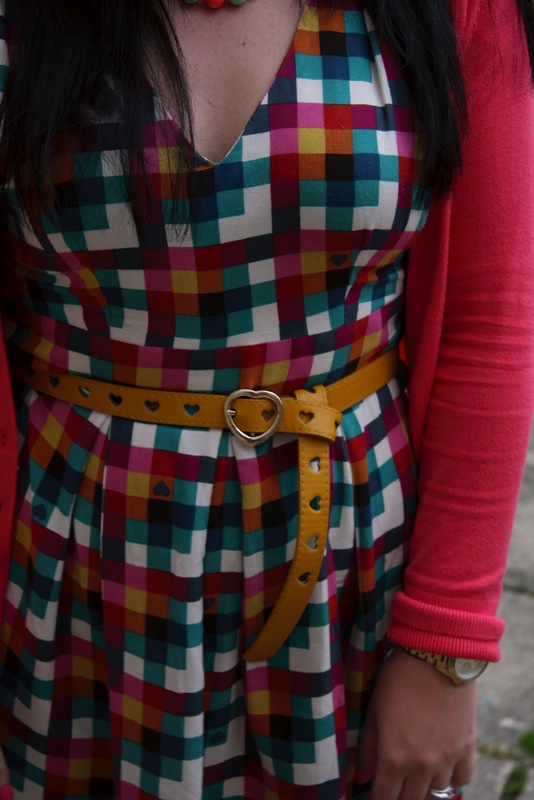 That belt is super cute with the heart cutouts too. And don't worry my legs are super white and it's been nice here so I really have no excuse. They are just destined to be white this summer! I love that dress! The matching pink and blue accessories go so well – great choices! I so hate this weather at the moment – one minute it's sunny and warm, the next you are furiously trying to to flash the world! I'm obsessed with that dress! The dress is wonderful. It's like an instant party the moment you put it on. Stopping by from Monday Mingle. Have a fabulous week! Love that cheery dress! And even here in hot, hot Florida, plenty of us have milky white skin, so we are cool with that : > Thanks for linking up to Visible Monday. I love your dress, the colours are gorgeous! Ed's Diner is amazing huh? I love the chilli fries! I adore the outfit, you look beautiful. LUV your dress. So super-cute. 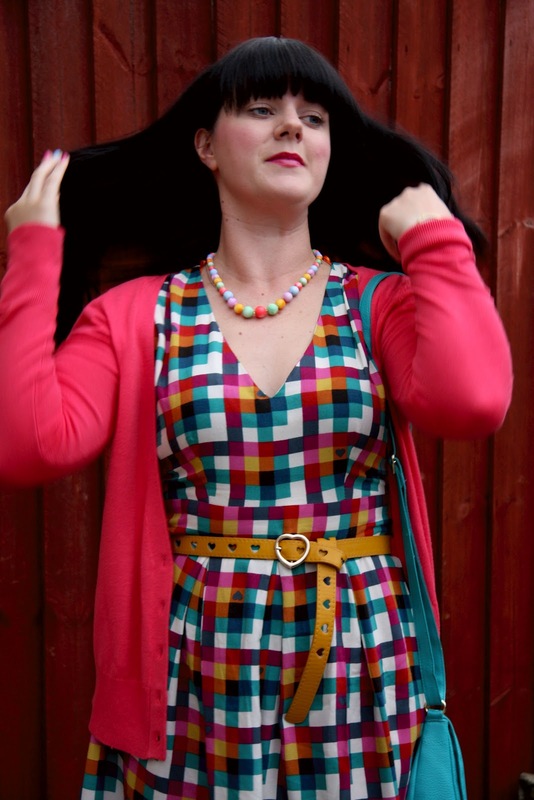 Congrats to Mia!That dress is amazing!love this blog! you dress and outift are so gorgeous so i didn't notice fair skin :))) look amazing! That dress is gorgeous, I love the colors! And that belt matches perfectly. 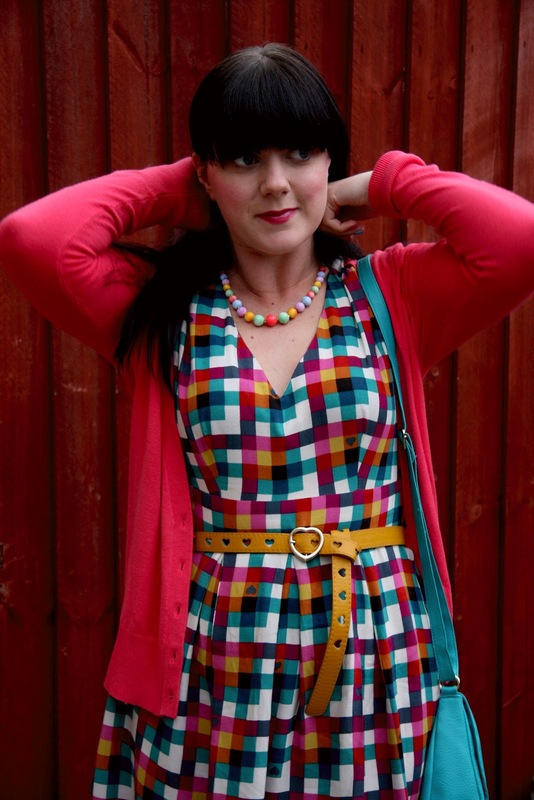 Cute dress and print, plus the cardi goes so well with it! I do love everything about this dress. I bet you can remix it so many times with all the pretty colors!